Ford is launching a nationwide mobile service programme, providing a range of SMR work including warranty and pre-delivery inspections for both cars and vans. Ford trained technicians will carry out servicing and warranty repairs. 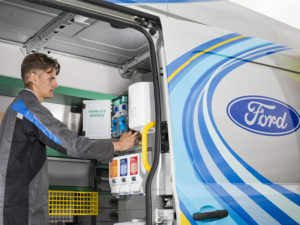 Introduced following a successful trial around Greater London, the Ford Mobile Service programme will operate over 100 Ford Mobile Service vans with Ford qualified technicians from more than 90 Ford Transit Centres across the country, including Northern Ireland and Scotland. It will also be implemented at some service centres. The programme will be up and running from the summer and will use front-wheel drive 130hp six-speed manual Ford Transit Custom vans with a specially designed racking system by Edstrom, including custom shelving, storage and compartments. The vans also feature a 2.5-tonne jack and axle as well as a 4G-enabled on-board diagnostic system. Each van will be able to service up to four vehicles per day and will be able to undertake multiple services at any location.